I would like to see a video on how to cover up dark circles under your eyes. Makeup and me are new to each other even though i am older I still don't know what I am doing half the time. I miss watching your monthly makeup drawer videos! Please bring them back!! I'd absolutely love to see a natural hair video! Ar the moment, I find "un-haul" vidoes fascinating. I also enjoy declutter videos. Id love to see declutter vid's, project pan, or empties. Your channel and you are awesome. Maybe a skincare routine? it seems like we share a similar skin type and I'd be really interested to see what you use! I love all of your videos, but my favorite regular one is the oily skin series! Since my skin is super oily, it's nice to see you shed some light to this inconvenient problem :D I would love to see like a top5 or something like that of moisturizers that are good for oily skin... Love your Channel!! I would love to see more Canadian beauty options! I would love to see and updated oily skin diaries. An updated video on foundations you've previously reviewed but to discuss weather you still use them, which is your favourite for everyday, which is your favourite for a night out, etc. :) I also would love to see some Halloween makeup tutorials! I would love to see you do a video on under 5 dollar challenge that emily noel and zabrena did .. I love your videos not only for the products that you recommend (essence, of course) but also because thanks to you, my english has improved. Keep going! Your favorite drugstore or high-end products with swatches. I always love hauls, empties, etc.! Thank you! I would like to see more cooking videos. I would love to see brand reviews/hot or nots, and half high end/half afforable dupe videos where you do check-ins to see how they last would be awesome! I would love too see more cooking videos to see what delicious meals you make next! I always try them! Also, more empties to get your recommendation on products because I genuinely value your opinion when it comes to products because most of your recommendations work for me! Just keep the videos coming! I wanna see a hair routine or a wash and go! Something like that because I'm always interested in how other people do their hair! Love your videos. Love to see more essence hauls. You are great! Love your channel and congrats! I love declutter videos! Congrats on 10k (and almost 15k :)) your channel is so great! i like to see more get ready with mee.. I like dupes for high end products or some of your must have colors for fall looks! 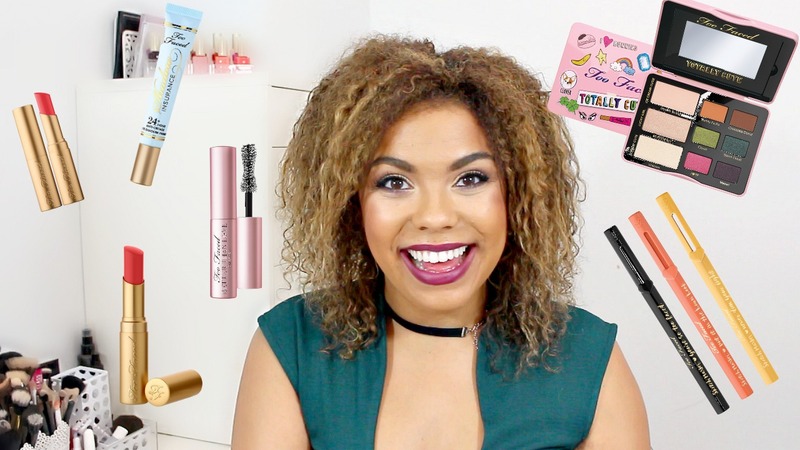 i'd love to see a video with solely canadian makeup brands! I am enjoying your oily skin diaries series! Please keeping making more! I would love to see your favourite primers of all types from the drugstore! I love seeing lip product favorites of different shades, e.g. favorite nudes, plums, spring shades. I love to see a Canadian making it on YouTube. Would love to see more Canadian specific things...Quo revi was, how to get stuff in Canada, etc. People have left great suggestions! I have to agree with the person that said to continue doing more "Oily skin diaries"! Recently my skin has been a bit oilyer so I'm looking for new recommendations!!! I would also love to see like a vlog type video where you shop around and show us in what Canadian stores you find what products (sorry if that doesn't make much sense haha) I just have a hard time finding some drugstore brands (in Vancouver) so I'd love to see what you can find where! Congrats on the almost 15K!!! Your channel is awesome and the time and effort you put into your videos is truely reflected in the quality and content so thank you!! I absolutely appreciate it! I'm so happy that more people have found your channel! I started watching for the oily skin diaries and then stayed for everything else!I would love to see different powers and primers for oily skin! I would like to see how to cover extreme under eye bags and dark circles and how to get free samples or products from companies. (besides the usual influenster, chickadvisor, Bzzagent, etc) thx for the giveaway! I aways love watching your videos! Thanks! Would love to see some out and about vlogs or whats hot in the city videos. Newfie girl here that lived in Toronto for a while miss it dearly! Do some Halloween makeup vids or vlogs! I'd love to see your makeup ideas. I would love to see an oily skin diaries or a Little chit chat about you as a person: What you do, where you were raised, why you started with YouTube, etc. I'd love to see more fashion videos. Your jean video was great. I would really like to see your favorite makeup brushes, I'm in the market for some new brushes and would really like some input! Congrats ! I love hauls and disapointing products! Thank you!! Thank you so much for this giveaway!! I'd love to see more tags and maybe some one brand tutorials. I would love to see more makeup reviews! I love your channel! best primers for oily skin and how to shrink pores videos!! Hi! I know it is a really weird request but i would like to see a video about the sunscreens you use. I have very oily acne prone skin and live in a tropical country, i refuse to use chemical sunscreens for enviromental reasons but i find physical ones hard to find (expensive locally) or finda many mixed reviews; besides that i dread the "white cast" since i am naturally tan. So i'd like to watch your sincere stand on the matter. I want a makeup collection video as well as declutters!! Congratulations, you deserve many many more! I really hope to win something! I would love to see a makeup collection. And congrats on 14k!!! More oily skin diaries, like all-day errday. Would love to see an Anti-Haul Video! Recently I really liked your fashion video with the Dynamite jeans and your Vlog! More of that please! I only found your channel a few months ago, but I have been watching religiosly since. I would love to see more new at the drugstore hauls. Would love to see a Joe Fresh makeup review for is Cdn girls! I'm obsessed with palette bingo! I love your oily skin diaries! Any videos where you are doing oily/combo entered stuff or Canadian beauty entered stuff I would love to see! Joe Fresh and Quo, or Annabelle and Marcelle! Ps I really like these twisty up lip colour things from Annabelle. Really pigmented! I love the colour havannah! I love seeing your channel grow! I feel like we are friends well I guess we are internet friends!! I love to see you are out your comfort zone and try new Gibbs with your channel. You encourage me to not be afraid to do the same and to keep on pushing even when people try to bring you down. I'd like to see a battle of the matte eyeshadow palettes. I'm interested in a review all the stuff Avon's sent you lately. An Avon haul or review? my mom lets me order stuff from them, and its easy for my family. i have oily skin as well and would like to know hit and misses. I love your channel, congrats on hitting this milestone! I love Too Faced as well and would love to see a Too Faced collection video/favorite Too Faced products video! Congratulations! I've been watching your videos for a while and I reealy enjoy them. Youre so natural in front of camera its amazing! Youre great! I'd love to see more oily skin foundation tutorials! I love to see your skin routine, the empty of the month. It's so cool of you to host a giveaway! I've always loved makeup although I've never actually used them, I've only used lip balm and the occasional salon appointments for prom. In my country, makeup is very expensive. Unless you're rich, you can't afford them, even the drugstore ones. One L'Oreal foundation could literally pay for my college enrollment fee. So yes, I love giveaways! Even though I only have 0.01 chance of winning it's still fun and exciting! Thank you for this and more power to your channel! I found you through your essence reviews so I hope you do more of those in the future! I tend to like reviews of stuff people have had for a while rather than first impressions, so I gravitate towards collection videos, declutters, yearly faves and empties.. etc! I would love to see dupes/ other options for powder foundations that compare to the Mac studio fix! As a Newfoundlander I would love to find a comparable one that I can grab at Sephora! The studio fix power is something I tried when I first watched your channel, on the old one, and now it's a ride or die item!! I would love to see you do a project pan. Would love a makeup collection / declutter video! I would love to see videos on top concealers and tricks with tips. Would love to see more fashion posts from you! I think you have great style! I would love to see you do a 1 brand full face tutorial with Essence products! I love your style more fashion hauls and try ons! And chatty get ready with mes are always fun. i would love to see a teeth whitening post! I would like to see drustore favorites! I would love to see a hair tutorial!!! congrats and thanks for sharing all these wonderful presents! I would love to see best and worst of drugstore brands. Your favorite brands from the drugstore, drugstore skincare that you love. I'd love to see a makeup tutorial for holidays and new makeup collections. I'd love to see a fully cruelty free makeup tutorial or GRWM because I find that it's important to protect the animals from unnecessary harm. I think you already are doing a great job! Keep up the good work, its always a pleasure to watch your videos! I would like to see korean beauty product hauls or products that help clearing skin discolorations. ROUX, WE NEED MORE ROUX. Can you show affordable primers and mists? I would like to see more Get Ready With Me videos!! Your attitude is so refreshing. I would love to see some fun make-up tutorials with crazy colors! I love your Youtube videos. You always look gorgeous! I would love to win those goodies! Love your videos! Would love to see a halloween inspired look or more GRWMs! love your videos! I would love to see more oily skin diaries!